Baritone Thomas Hampson sings Stephen Foster with Jay & Molly and guests. A compilation of great Catskill Mtn. music – Jay & Molly and other artists. Jay & Molly in a live concert of Civil War music at the Civil War Institute. Jay & Molly tour the seasons with the Nashville Chamber Orch and other guests. Original and traditional romantic fiddle classics – Jay & Molly’s most popular CD. Live performances with great guests from Jay & Molly’s annual winter holiday special on PRI. A collection of music for healing – including 3 new recordings. Country, Blues, and Swing with Jay & Molly’s band Swingology. Catskill Collection [CD] Jay & Molly’s compilation of music of and about the Catskill Mountains featuring traditional and original music in a wide range of styles including Celtic, Klezmer, Bluegrass, Fiddle Tunes, New Age and Classical. Here’s the list of artists: Penny Nichols; Artie Traum and Bill Keith; Abby Newton; David Levine; Bill McComiskey; Lyn Hardy; John Kirk and Trish Miller; The Hawk Project; Tony Levin, Steve Gorn and Jerry Marotta; Leslie Ritter and Scott Petito; Cindy Cashdollar; The Oslo Philharmonic; Klezmer Plus; and of course Jay & Molly, who play some tunes of their own and sit in with several of the artists. 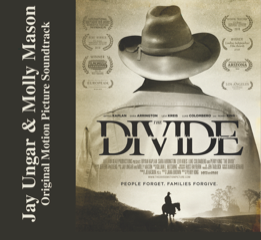 The quintessential Ungar & Mason movie score for “The Divide,” an American western set in drought-plagued California in 1976. Most tracks were composed and recorded live to the film with little EQ and few effects, to retain the pure sound of fingers and bow on acoustic instruments, The result is simple, strong and deeply moving. Click here for the DVD! Live performances from Jay & Molly’s annual winter holiday special on PRI. An amazing array of musical friends join in the festivities, including: Laurel Masse; Kate Pierson; David Bromberg, Butch Thompson; Mike + Ruthy; Peter Schickele; Tony Trischka; Peter Ecklund; Peter Davis; Harry Aceto; Steve Rust; and Sam Zucchini. Here are some of the seventeen seasonal titles: The Unbroken Thread, The Snowstorm, Zat You Santa Claus, The Snowstorm, Lights of Chanukah, Rovin’ on a Winter’s Night, Darkest Days Brightest Nights, Midnight Hour Blues, Sermonette and more. Relax Your Mind [CD] a collection of country blues, waltzes, vintage jazz, western swing, two steps and Dixieland jams, recorded with Jay & Molly’s band Swingology. With its laid-back grooves and toe-tapping melodies Relax Your Mind is destined to be the soundtrack for your day off. This CD includes Home Grown Tomatoes, Blue River Waltz, Relax Your Mind, Bob Wills Medley, Ookpik Waltz, Back Yard Symphony, Old Madera Waltz and many more. Song of the Hills [CD] – Instrumental Impressions of the Applalachian Classics with Jay Ungar, Molly Mason, Eric Weissberg, Norman and Nancy Blake, John Sebastian, Bill Keith, Brian Keane, Lorraine Lee, Tony Trischka, John Doan, Peter Blue, Kenny Kosek, Stacy Phillips, Alan Feldman, John Sholle, and John Whelan. Jay & Molly sit in with several of the artists and also perform their own versions of Midnight on the Water, Seneca Square Dance and Tombigbee Waltz.